← Windows 10: App History without Microsoft account? 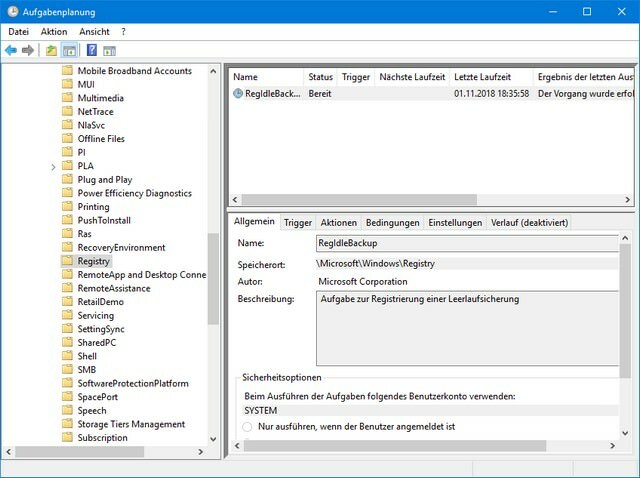 [German]Windows contains a feature that creates a backup copy of the registry files at regular intervals. In Windows 10, however, it looks as if this task fails in versions 1803 and 1809. 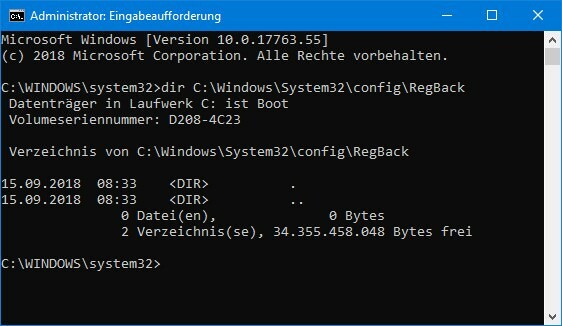 In Windows there is a folder C:\Windows\System32\config\RegBack in which the operating system can cyclically store copies of its registry files. There is a task in the branch Microsoft -> Windows -> Registry in the task planner for this purpose. The system-wide valid structure files of the registry (hives) can be found. In SOFTWARE, for example, all installed programs can be found and under SYSTEM the registration keys for the system are stored. 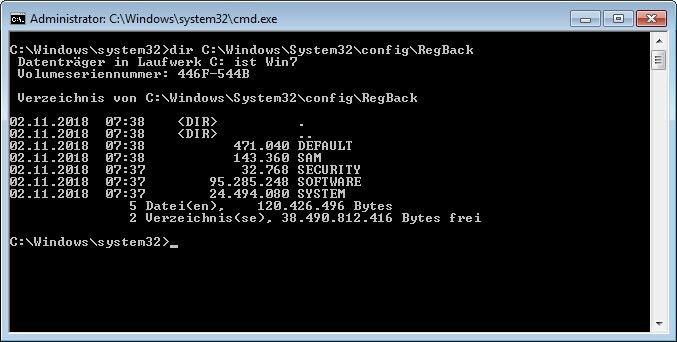 You can also try to copy backed up hive files from RegBack back to Windows PE manually. This August 2018 post describes these steps to manually retrieve the whole thing. This forum post describes an [unsuccessful] attempt to write the files back manually (the copies were probably already damaged). And the whole thing wasn’t really reliable – at least in this 2017 HP forum article there is one whose RegBack folder was empty when he needed it. Whenever the trigger of the task planning fails, no backups of the hives are written. In Windows 10 Version 1809 the registry backup task doesn’t work anymore. If you inspect the RegBack folder, you will see, it is empty, although there is a backup task. Major blow to the Windows emergency restore abilities (forum support). Seems that either this feature was deprecated, or a bug prevents the task from creating backups of the registry hives. It’s possible that due to MS’s own new overzealous security (file locking) in V1803/1809, which seems to prevent even them to read the locked registry files in order to back it up, thus you end up with a bunch of zero byte files. Luckily it can still be done by booting up with something like Hiren’s Boot CD and manually copying the entire “Config” folder containing a full copy of the registry. It’s pretty sad to see how unnecessarily high security takes precedence over system integrity. Hi there, I am getting error “preparing automatic repair” and I have checked the RegBack has no files. How do I go restoring my laptop?